Neurofibromatosis is a genetic condition that disrupts the cell growth in your nervous system, causing formation of tumors on nerve tissue. These formed tumors may develop anywhere in the nervous system of the victim, which may include the brain, spinal cord and nerves. Neurofibromatosis is usually diagnosed in childhood or early adulthood. The tumors are noncancerous (benign) in most of the cases, but in some cases these tumors become cancerous (malignant) tumors. People suffering with neurofibromatosis often experience only mild symptom and effects may range from hearing loss, learning impairment, and heart and blood vessel (cardiovascular) complications to severe disability due to nerve compression by tumors, loss of vision and severe pain. There is no specific treatment for neurofibromatosis, but treatment aims to maximize healthy growth and development and to manage complications as soon as they arise. When neurofibromatosis causes large tumors or tumors that press on a nerve, surgery may help ease symptoms. Geographically North America dominated global neurofibromatosis treatment market, due to advanced medical infrastructure and approximately half of the world’s procedures being done in the U.S. because of high medical reimbursement facilities, and technological advancement. North America was followed by Europe and Asia-Pacific as second and third largest market for neurofibromatosis treatment. Asia Pacific is projected to have fastest growth, owing to rapidly increasing population, rise in consumer awareness, favourable government policies, modernization of healthcare infrastructure, and growing medical tourism industry in developing nations such as China, and India in this region. This report identifies the Neurofibromatosis Treatment market size in for the year 2016-2021, and forecast of the same for year 2021. 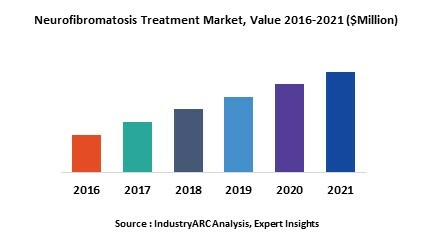 It also highlights the potential growth opportunities in the coming years, while also reviewing the market drivers, restraints, growth indicators, challenges, market dynamics, competitive landscape, and other key aspects with respect to Neurofibromatosis Treatment market. This is report has been further segmented into major regions, which includes detailed analysis of each region such as North America, Europe, Asia-Pacific (APAC) and Rest of the World (RoW) covering all the major country level markets for Neurofibromatosis Treatment in each of the region.